A Man for All Seasons is tasteful and moderately enjoyable; Robert Bolt’s dialogue is crisp, lucid, and well-spoken; the actors are generally efficient. Fred Zinnemann’s direction is placed at the service of Bolt’s material—in the manner of a good, modest stage director who does not attempt more than a faithful, respectful interpretation of the play. It’s pleasant to see a movie made with integrity and sensibility: A Man for All Seasons wasn’t that easy to do and it wasn’t “safe”—though it appears to have turned out well for all concerned. But that’s really just about all I can say for it. As conceived by Bolt, Sir Thomas More isn’t A Man for All Seasons: he isn’t particularly relevant to this season, I doubt if he’s relevant to any season. (And as interpreted by Paul Scofield, he’s not my kind of guy, either.) Bolt’s presentation of More’s martyrdom is so totally one-sided that we don’t even get to understand that side—as we might if it were challenged and engaged in conflict. 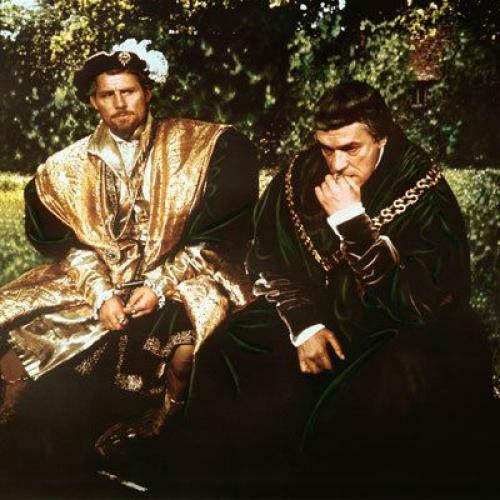 Though the principle for which he is beheaded (his belief that the Pope represents divine law so that he is saving his soul in taking the Catholic position against Henry VIII’s marriage to Anne Boleyn) seems doubtful at best, it is given as beyond question in this film that a man should follow the dictates of his conscience. (The Afrikaners willing to die for apartheid—and they find their justifications in divine law also—could probably make as good a case.) This More is simply right and he’s smart and good and just about omniscient (he even knows his Judas); his great opponent, Henry VIII, is vain and childish, and everyone else is weak, stupid, cowardly, or corrupt. More is the only man of honor in the movie, and he’s got all the good lines. Bolt’s More is the kind of hero we used to read about in the biographies of great men written for twelve-year-olds: the one against the many. Perhaps people think A Man for All Seasons is so great because unlike the usual movie which is aimed at 12-year-olds, it’s aimed at 12-year-old intellectuals and idealists. And if they’ve grown into compromising and unprincipled people, they can hail A Man for all Seasons as a masterpiece: heroism so remote, so totally the property of a supra-human figure, absolves them of human weakness. It becomes romantic. There’s more than a little of the school pageant in the rhythm of the movie: Though it’s all neater than our school drama coaches could make it, the figures group and say their assigned lines and move on. The camera, ever faithful to the author, does not open them up to us: they are set faces, fully—rigidly—formed from the start. For a too-brief sequence, Orson Welles’ Wolsey overpowers the orderly progression of attitudes, but then we are left with Scofield—so refined, so controlled, so dignified, so obviously “subtle”—just the way a man of conscience in a school play would be expected to behave.